The Pines Bridge Monument is a project to commemorate the soldiers who sacrificed their lives defending the Pines Bridge Pass over the Croton River during the Revolutionary War. The Rhode Island Regiment under Colonel Christopher Greene was comprised of African Americans and Native Americas as well as European-American settlers. 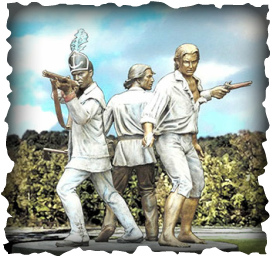 The monument is designed to reflect that diversity, and will be the first Revolutionary War memorial to depict all three races together in combat. Numerous letters of support and blessing from noted historians, re-enactor groups, and other public & private citizens and organizations have come pouring in. Anticipated costs for the project are approximately $300,000 which is why we need your help! Look for ways to contribute to the campaign and leave your mark on local history. Colonel Christopher Greene was in command of the Rhode Island Regiment at Pines Bridge. The regiment had approximately 200 men, many of whom were black recruits from Rhode Island. Greene was responsible for guarding Pines Bridge and its approaches, assisted by Major Flagg, a fellow officer who had fought with him at the Battle of Red Bank. On the morning of May 14, 1781, DeLancey’s Refugees slipped across the Croton River at the Oblenis Ford and advanced toward Col. Greene’s position at the Davenport House headquarters. The Patriots were only able to fire a few shots before being overrun. Before Greene could dress and leave the house he was cut to pieces by the Tory forces. Greene’s regiment put up fierce resistance, but they were defeated. Col Greene, Major Ebenezer Flagg and many others were killed in the battle, several were wounded, and over twenty soldiers were taken as prisoners of war. The Davenport House stands today on the north side of Croton Heights Road. The remains of Colonel Greene and Major Flagg are interred at the Presbyterian Church Cemetery in Yorktown. A mass grave somewhere near the Davenport House accommodates the remains of an unknown number of black soldiers from Greene’s Rhode Island Regiment. The Pines Bridge Memorial will commemorate the Battle of Pines Bridge where Col. Christopher Greene, the Black Freemen and Native Americans, members of the Rhode Island Regiment, perished on May 14, 1781 while guarding the Pines Bridge crossing and the patriot line along the Croton River. After months of deliberating and considering diverse designs, the Pines Bridge Monument Committee (PBMC), in conjunction with the Yorktown Chamber of Commerce, the Yorktown Historical Society, and the Yorktown Planning Department announced the selection of the design by renowned sculptor Jay Warren from Rogue River, Oregon. Mr. Warren's previous commissions include both portions of the New Jersey World War II Memorial, the New Jersey Korean War Memorial, Victims of Terrorism Memorial at the Raritan Bay Waterfront Park overlooking the World Trade Center Site; John Coltrane Monument in High Point, NC, and the Sojourner Truth Memorial in Northampton, MA among many others (www.warrensculpture.com). The monument will be comprised of three statues including a Native American soldier, an African-American soldier, and a White soldier. This diversity would represent the inter-connectedness of each group in the fight for independence that centered around Yorktown’s Pines Bridge in the 1700’s. The statues would be life-size plus (approximately 8 ft. tall), and made of bronze. Bronze is the best material to be used due to its low susceptibility to the outdoor elements. The memorial will be situated in Downing Park across from the Presbyterian Church where Colonel Greene was buried on Route 202 in Yorktown. Vendors will be able locate themselves at this landmark to sell goods, food services, etc., and local school districts can incorporate this element of local history into their respective curriculums that NYS Education Law requires they teach about the American Revolution. Buy a brick to support the Pines Bridge Monument! Personalized with your own inscription to the memorial. Check our calendar for news of fundraising events.